We have just had a great discussion on the www.jiscmail.ac.uk/ldhen list about Writing Retreats – that developed into thoughts on Music workshops. So here are our ideas from this day in May 2014 – it would be great if you could share your own creative strategies for getting students to write – or just getting them to be with each other in engaged and engaging ways. This post looks at Sing-Write; Rich Writing; Make music like Mozart; Free writing prompts; Academic free writing. All say “blah blah blah” and start to wander around the room in any direction saying this continually – try different notes and changing the ‘tune’ whilst still saying blah blah blah! On our Art History MOOC - one rich writing activity that we had to do was to sit with an art work for an hour. We had to find a piece that was interesting or meaningful for us and then be with it - we could make notes or anything - but we had to quietly be with it for a whole hour. We then had to write 300 words on the artwork. 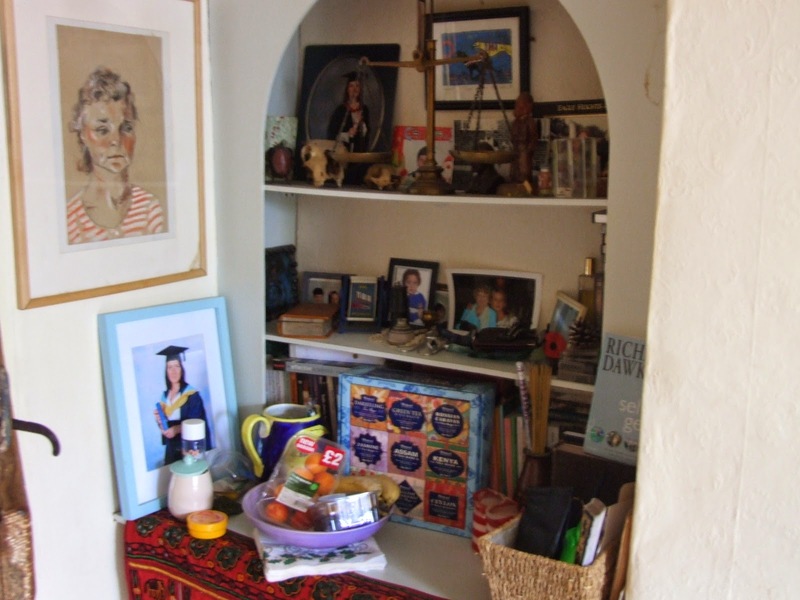 I chose to sit with the picture of my mum (on the wall in the photo below) - and found the exercise both moving and really useful. After the hour I had more notes than I could use in a 300-word write up. It was a really rich experience. Ask your delegates to think of a sound that they can make. If they claim to be having difficulty, then examples of sounds could be clapping, popping, shrieking, humming etc. Have them all make their sound as they walk around the room, and just enjoy the noise. Encourage them to play with the sound - to change it or make it louder, or more unusual. Then invite someone to draw their sound on the board, and to repeat it at regular intervals across the board. This will form the base-line around which the rest of the composition will be built. Have them make the sound to illustrate what it will sound like. Repeat the process with other volunteers until you have a composition of around five to seven sounds. Now appoint a conductor who will cue the performers when to begin. The resulting sounds should pleasantly surprise the delegates, and illustrate the principle of synaesthesia. into groups composing music in response to a picture - and performing for each other. A finale activity was to choose the audience before whom we had to perform - we chose Glastonbury - it was fabulous!!! * Have two pieces of paper in front of you – focus on something you can see, hear, feel, smell – write… If you stop writing, write the reason for stopping on the second piece of paper. Reflect on the activity. Set up a session of one to one and a half hours long. Ask students to have two sheets of paper in front of them - one for writing and one for writing why they are not writing. After reassuring the students that their writing will not be marked - put up a relevant assignment question (either one that they have been set - or a relevant one that they might have been set) - ask them to write without stopping for ten minutes on the question - and to write the reason why they have stopped (for they will) on the second sheet. * What was your reaction to that process? * Why did you stop writing? * What can you take from this process into your other academic writing? What is interesting is that whilst for academics the writing issue often is: 'Students can't write - their spelling, punctuation and grammar are awful.' The issue for students is overcoming a fear of writing - so space to discuss their feelings about writing can be the freeing activity.